(Nanowerk News) Piezo scanners are fundamental tools for high resolution microscopy as the rapid response and sub-atomic resolution is instrumental in acquiring high-quality images quickly. 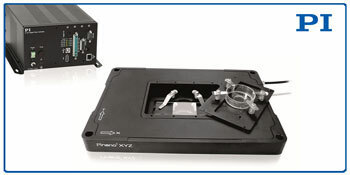 As an industry leader in motion and precision positioning products for scientific applications, PI has released a 2nd generation of its successful PInano® product line of high resolution XY/XYZ multi-axis positioning systems. The package includes the piezo scanner, software, and a new, state-of-the art digital controller. The easy-to-integrate low profile (20mm/0.8”), long travel of 200µm, and millisecond step time make the PInano II piezo positioning systems ideal for super-resolution microscopy and imaging applications. Microscope slides and Petri dishes are easily accommodated in the large clear aperture. Preloaded PICMA® high-performance piezo actuators feature cofired ceramic encapsulation and provide better performance and reliability than conventional piezo actuators. Actuators, guidance, and sensors are maintenance-free, not subject to wear, and offer extraordinary reliability and cost-effectiveness. In life tests carried out by NASA/JPL for the Mars Mission, the actuators survived 100 billion cycles without failures. PI is a leading manufacturer of precision motion control equipment, piezo motors, air bearing stages and hexapod parallel-kinematics for semiconductor applications, photonics, bio-nano-technology and medical engineering. PI has been developing and manufacturing standard & custom precision products with piezoceramic and electromagnetic drives for 4 decades. The company has been ISO 9001 certified since 1994 and provides innovative, high-quality solutions for OEM and research. PI is present worldwide with eleven subsidiaries, R&D / engineering on 3 continents and total staff of 850+.